All the photography podcasts lately are seriously discussing backup techniques. They all discuss the very expensive method involved in using always accessible, always powered hard drives, and never get into the alternative of archiving on CDs or DVDs. Can you address this alternative in one of your upcoming podcasts or blog posts? (I'm thinking more of purely archiving the files right from the flash card before even being imported into iPhoto, Aperture or Lightroom, etc and then storing these media in a really safe place) Why does this not seem to be a considered alternative, given that hard drives have a probability of crashing and therefore you have to spend big bucks for all the active backup techniques? First, thanks for sharing your backup strategy with your listeners. I too am considering how to make my backup strategy more robust and DROBO is on my list of options. I listened to the podcast and I asked myself, "Why does he not use one of the "Pro" applications or even iPhoto for a single place to catalog all your photos?" In other words, in your opinion why do you not use Aperture or Lightroom to catalog, instead of the Microsoft app you discussed in the podcast? Also, I am very interested to know which app you prefer Lightroom over Aperture overall? I would love to have you dedicate an entire podcast outlining the pros and cons of each in your opinion. Just a couple thoughts here. I think the reason why you see backup discussions focusing on using hard drives is because of the large amount of data we have to manage. Anyone shooting Raw is going to have way too many gigabytes to store on DVDs, let alone CDs. So bigger storage is required. I do use Aperture and Lightroom, and I love the Vault system in Aperture and highly recommend it. But I also like to have my Master images in a second location, just for ultra safe keeping, and that's why I investigated the Drobo. I like Expression Media as a cataloger. It has only become a Microsoft product recently. For years it was iView Media, and developed by some very smart people. More to discuss about all of this! 1. Create the vault on a directly connected hard drive. 2. Drag the vault onto the network drive. 3. The vault now shows its status as disconnected. Right click on it, choose "Update Vault Path", and select the new location. First: I want to second Andreas' suggestion about Aperture. Though listening late, he beat me to it. Although being that the Drobo is USB you can directly connect the Drobo to you Mac and back it up there. 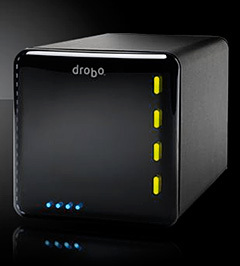 Once reconnected to the Drobo wirelessly, you'll still have to reconnect the Vault. Also, it's probably best to do a first run vault through USB rather than 802.11n. Also, this is minor. You said that Aperture needed a FW drive for Vaults. Aperture also works with USB drives. Now onto optical media. It's not a bad way to backup and it CAN be cheap. With DVD's (depending upon how you work) you can fit enough files on a DVD (maybe 2-3 a shoot. This obviously not practical for a pro sports shooter shooting 12MP RAWs @ 10FPS.) However, cataloguing and labeling DVDs can be a pain. Then it's time consuming to do so. Dual Layer DVDs at 8.5GBs aren't bad as far a capacity goes. But they cost more and take a while to burn. Then there's Blu-Ray. It's ridiculously expensive right now and slow, but at 25-50GB per disc the capacity is excellent! Then you must consider how easy it is for something to wrong during burning -well not with a MacPro unless there's a 9.5 earthquake rolling through town. ;-) (That's got bigger problems!) But you need to consider storing DVD's and the type. Which effects how long they last. Bottom line DVD's work fine for now but they aren't always the easiest fastest or cheapest now. What I'd recommend is finding a hard drive (one is just what you need) and work with that for a while. Then if you want you can get a second HD and rotate the disks between work and home for off site backups. There's no need to get complicated with RAID when starting out. I'm 15 and don't have much cash. But I save up for a while then get something. I've got most of my drives from gift cards or presents. (I've only got a few, but by the time I'm 40....) I should also put that I'm more than a bit paranoid about my data. Also Derrick which email should I use if I was a signed book plate? As with the length of time that you had to wait for your initial Drobo backup, the initial backup you make to this service will take a while (depending upon your internet services upload speed, expect this to take days rather than minutes!) - and the service costs $4.95 per month - so it is by no means a perfect solution, but having lost my son's first xmas photos to a hard-drive failure, Mozy helps me sleep a little easier! As everyone knows, the weak link in any backup strategy is sitting down reading this comment! I find that personally, if my backup strategy is not automatic, I don't do it (even though I know better). I receive two Amazon gift certificates each year from my aunt in Germany and have always been happy with my purchases. It gives her the freedom to send me a gift without the hassle of mailing it and gives me the freedom of getting just what I want. I love it! There are lots of stores to buy from. I have bought, books, music, quesadilla maker, bassinet, the list goes on. No hassles, no lines in the stores, ships right to my door. Thanks Amazon for making shopping online enjoyable and easy.